Kuala Lumpur International Airport has been on the news a lot in recent times. This was the last airport from which flight MH370 took off headed for Beijing and has not been seen since. The story of the missing airliner has baffled many. KLIA, as it is affectionately known, is Malaysia's main international airport and serves the greater Klang Valley. Built at a cost of US$3.5Bn it can handle 40 million passengers per year and 1.2 million tons of cargo. 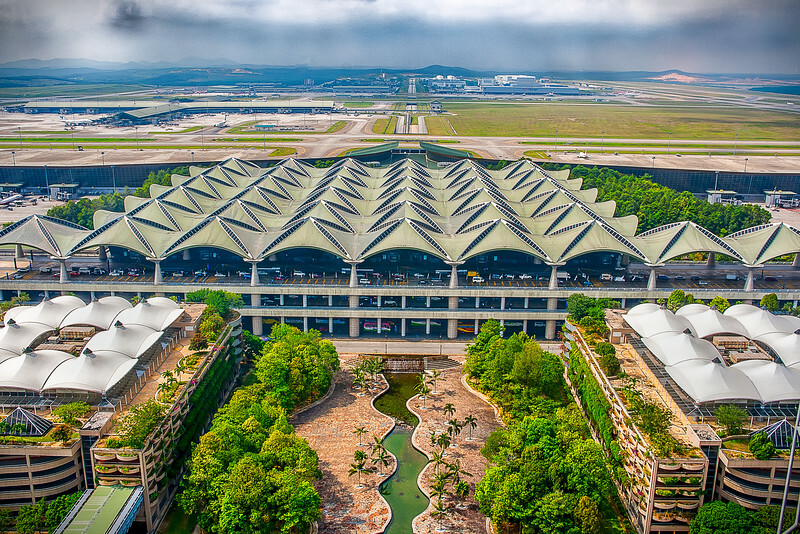 KLIA was officially opened on 27 June 1998 a week ahead of Hong Kong International Airport. This 3 exposure digitally blended photo was shot hand-held from the balcony of the current air traffic control tower, a new tower has recently been constructed as part of the KLIA2 development. On either side of the main terminal building are two multi-level car parks in the background to the top left is the satellite terminal mainly used for international airlines.